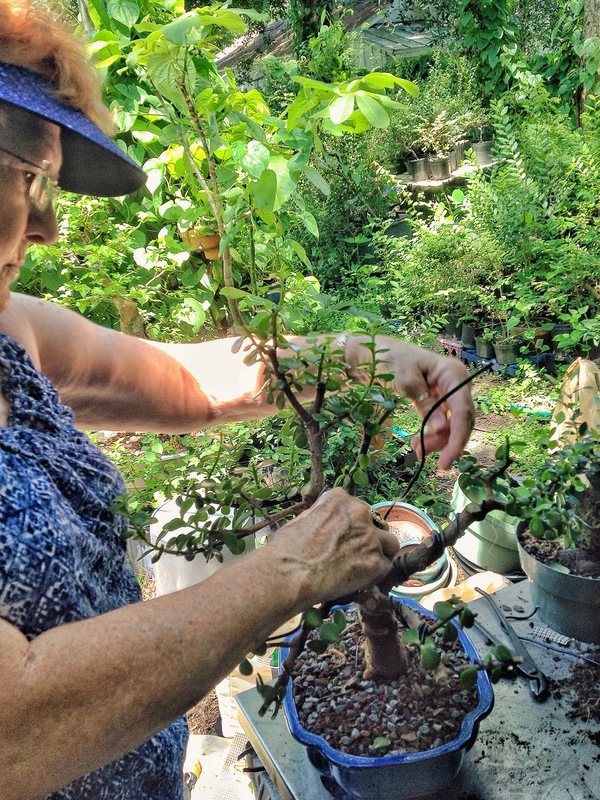 Last Sunday, my friend Barb came over to have me help her work on some of her trees. There was a tamarind, an ilex, a sweet little green island ficus and others. 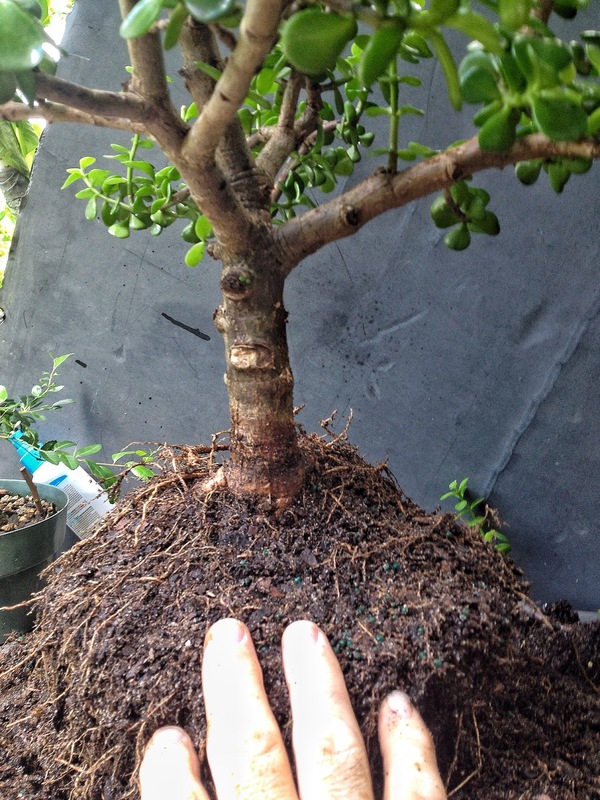 We did quite a bit but what I thought I should show you (considering the recent portulacaria post) is the work we did on her portulacaria afra. It was a tree that was purchased from Allen Carver of Jupiter Bonsai when he was here at my nursery for the NoNaMé Studygroup a few months back. I should have had more foresight when I started but I didn’t get any before pictures, so here we begin with my hands already in the dirt. I’m obscuring the base to show you what Barb and I saw before I started removing the soil on top. The dwarf jade hasn’t been styled yet so that’s why Barb brought it. I asked her what she thought the front should be. She didn’t know it, but it was a trick question. 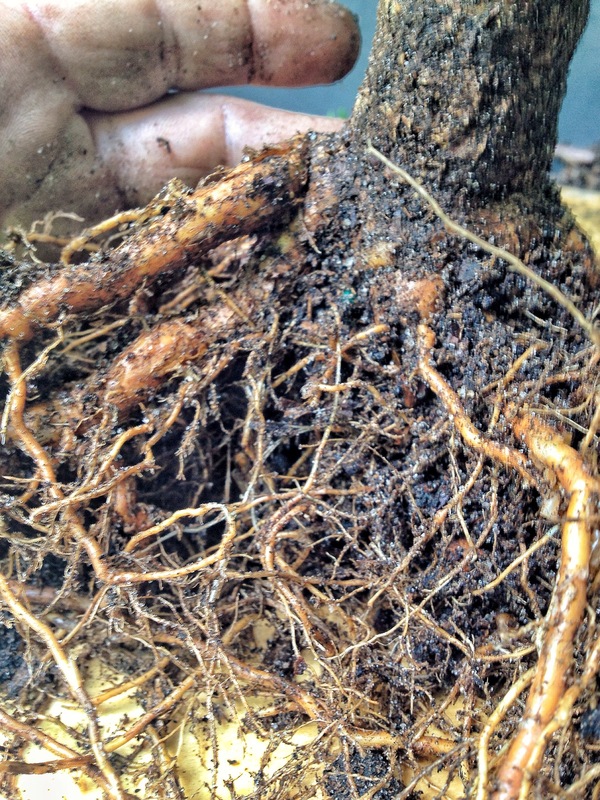 She had chosen a front but hadn’t dug down to look at the nebari (the root spread). The pic above shows her front with my hand at about where the soil level was. If we turn it around 360 degrees it’s still kinda lame. 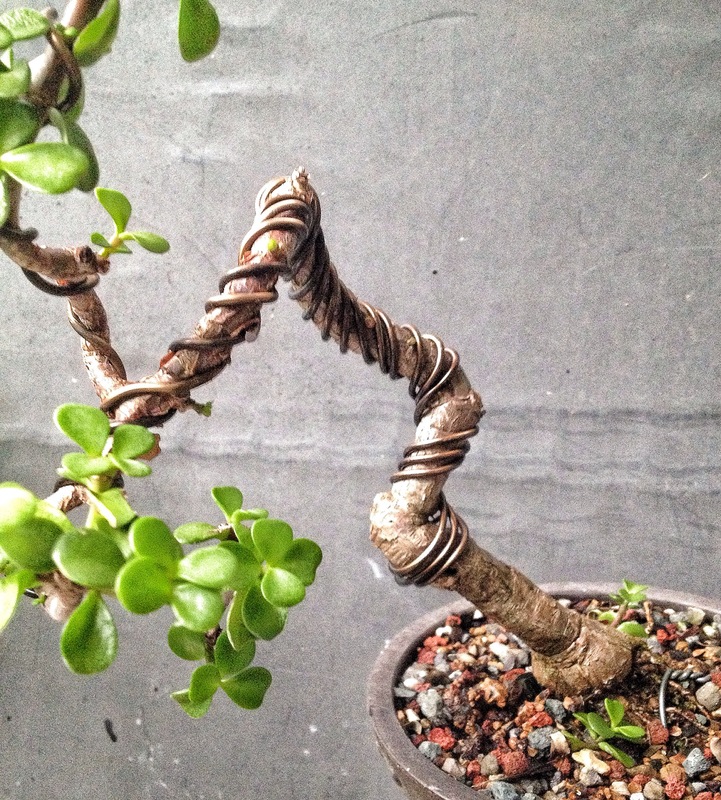 But…BUT.. if we only turn it 179 degrees the nebari is almost like a 180 degree difference. The proposed front is, in actuality, the most expeditious back, and the previous back is, aesthetically, the more virtuous front. 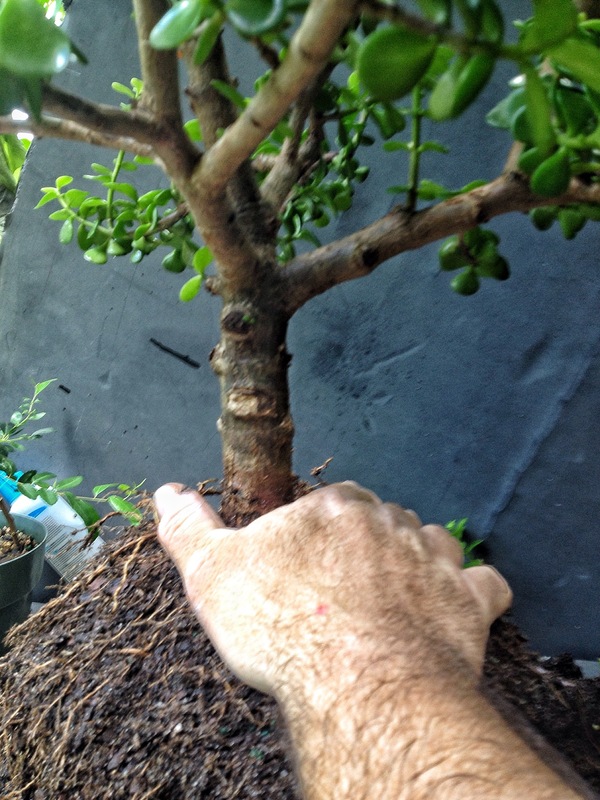 With that done, I can really get my hands dirty now putting the tree into some bonsai soil. 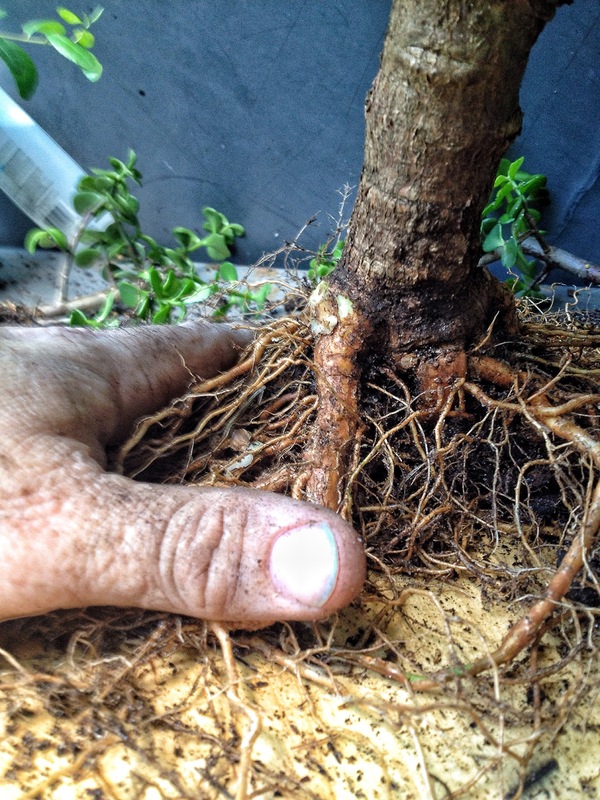 The basic technique is to massage the roots and comb them out of the soil. 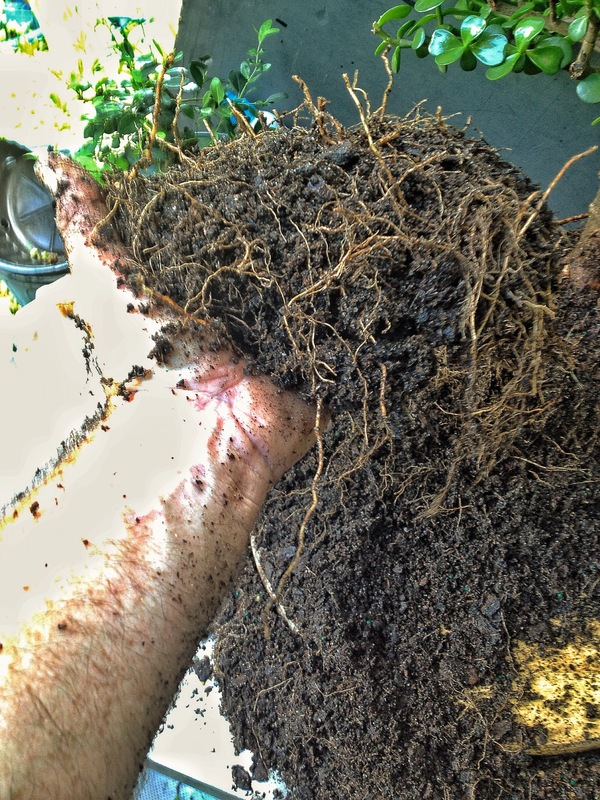 With ficus or deciduous material I’ll go get the hose and wash out the dirt. 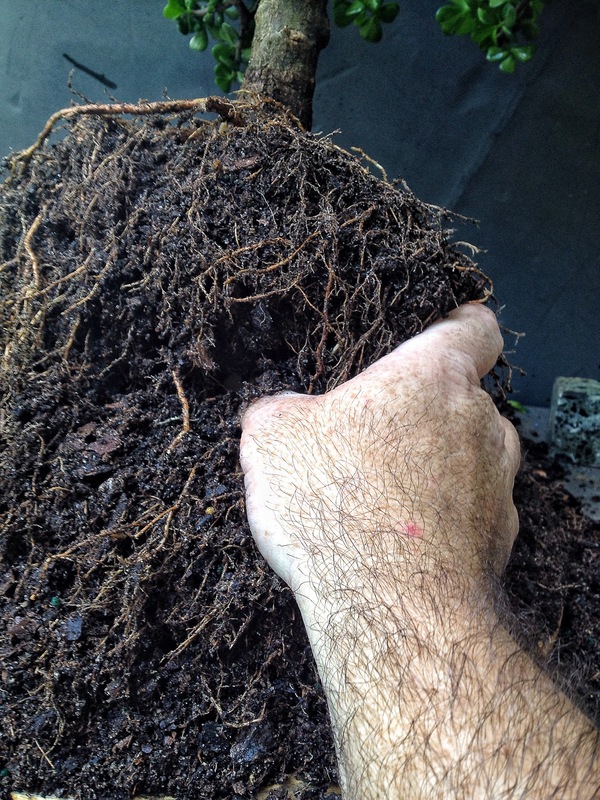 Well, it’s not really dirt, it’s a specifically made mix for Florida, but it’s not bonsai soil. If you remember the last post on dwarf jade, you’ll know that I don’t want to water the tree for about a week after repotting. Keeping that in mind, and since I need to get as much of the old soil off the roots, I can’t use the water hose to clean it up. You know those little, almost useless, coconut fiber brooms that come in the tool kits? They work perfectly in brushing off that offensive dirt. Like dry cleaning. Unfortunately, on my trip up to Ohio, somewhere around Tennessee or Kentucky, I threw mine out the window. I had to use a whisk broom. The jade had been in a three gallon container, which means about 2 gallons of potting soil left over. Pretty rich and fertile looking, maybe I’ll grow some turnips. 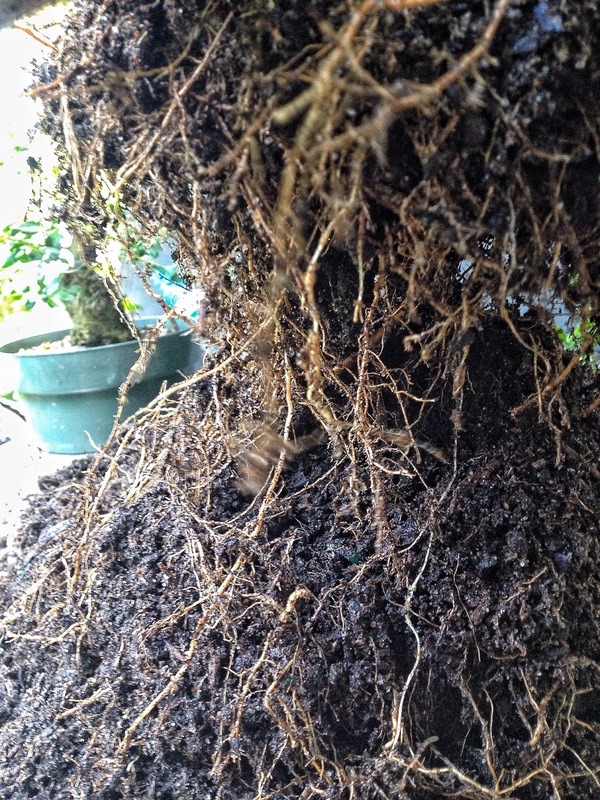 The roots are pretty nice except for these two, one on top of the other. I could try to bend the top one down but it will never look quite right. 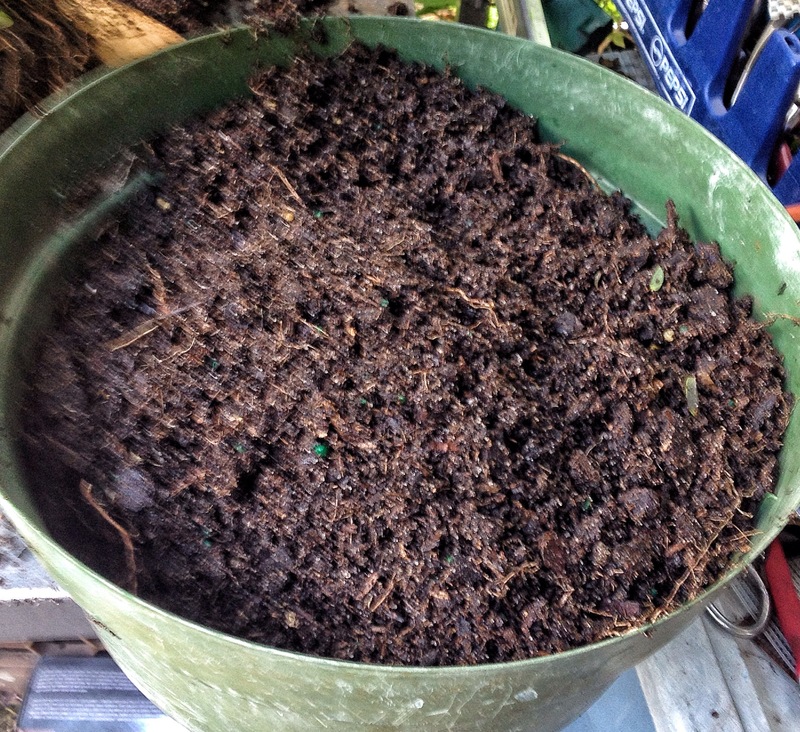 Eventually it could go in a more shallow pot but I like the deepness this pot has, which will improve drainage. 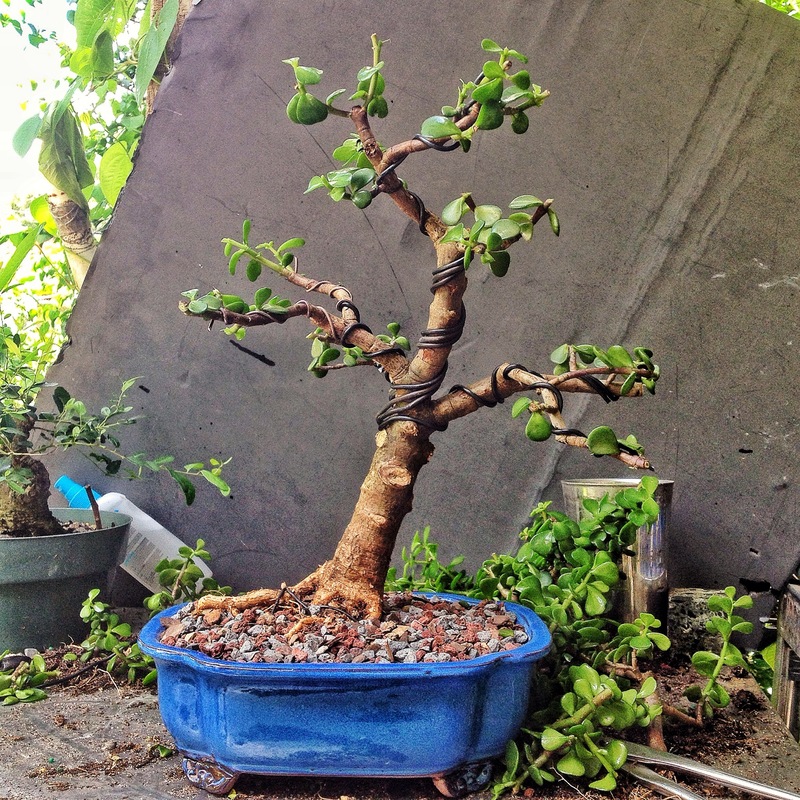 After the operation when you switch from “potting soil” to “bonsai soil” is when a dwarf jade is most often going to have root rot. Therefore, let me repeat, don’t water for at least a week. All the leaves will fall off (don’t be alarmed) and when you see new, little leaves start to grow you can begin watering again. Now for some wiring, and bending techniques. Wire as you would wire any tree but you can use 1/2 to 1/3 smaller wire than you might think you need. It’s a little more flexible but in the same way that celery is flexible. 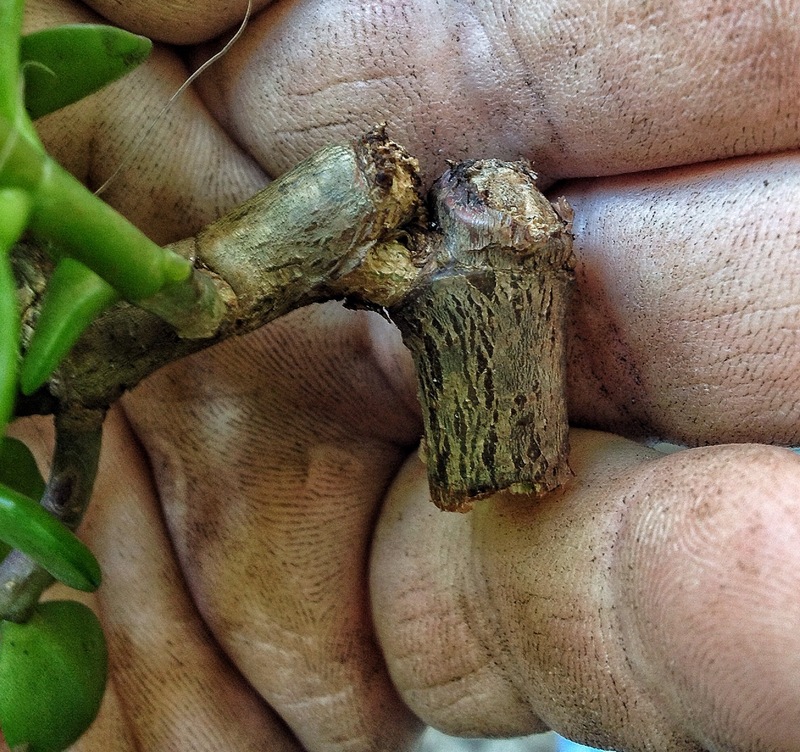 If you bend it too much and too fast at one time, you may end up with an opportunity to experience the joys and miracle of vegetative propagation. I had Barb wire it……heh heh, barb wire…get it? Tee hee! I also believe in using two smaller wires as opposed to one larger wire. 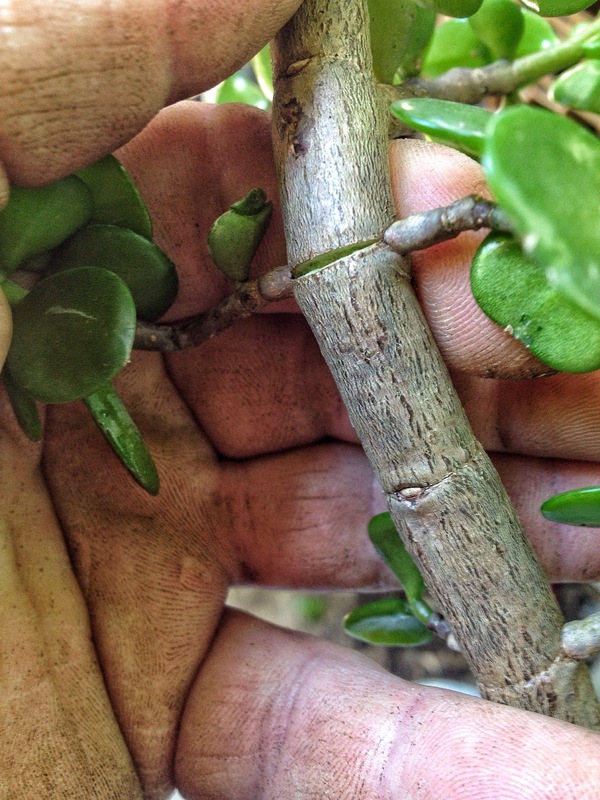 Especially on tender barked trees like the jade. Heavier wires present more situations where wrapping the wire could damage the bark. And two wires will help diminish the risk of breakage when bending the branch. Especially if you do something like this. You’ll notice that in places I didn’t place the wire in the dogmatically approved, side-by-side, attitudinal persuasion. The wire acts as a brace and prevents (to a certain degree) breakage. Rob Kempinski has the most erudite explanation of the physics involved, especially when using raffia in the same way. I haven’t decided if I’m going up or down with the above bunjin jade. What do you think? Getting back to Barb’s tree, and the lesson, when bending you have to look closely at the segments. 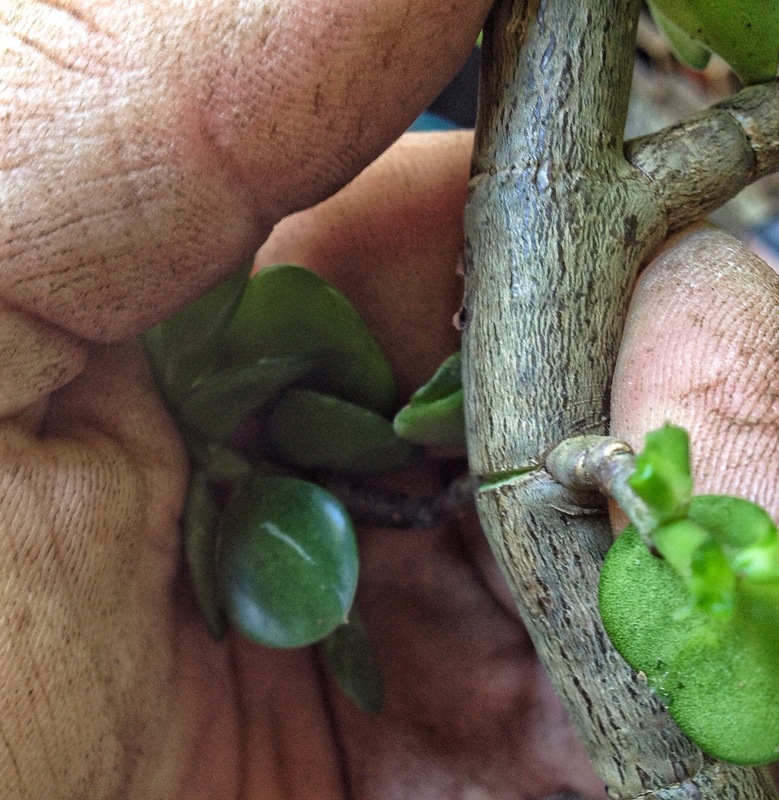 The jade will bend between segments, if they’re long enough, but the stress is at those nodes. You can go too far. The above pic is unusual, a break like that will usually just cause the branch to dry up and fall off. After a little bending, tweaking, and sweating, here’s the finished tree. When I am done with a tree that’s been cut back hard (I’m a bit notorious for hard pruning) I don’t see the naked branches or the sharp sticks. I see the tree filled in, like this. I recently attended a demonstration by the classiest man in bonsai, Master Ed Trout. One thing he said to the audience, and it struck a chord with me because of all the drawings I do, was that it’s hard for the audience to see the future look of a tree after you chop it back. Early on in my blogging experience I had a reader complain that he couldn’t see where I was going with a tree, much in the same way Ed was talking about. That’s when I started showing sketches and photo doodles. 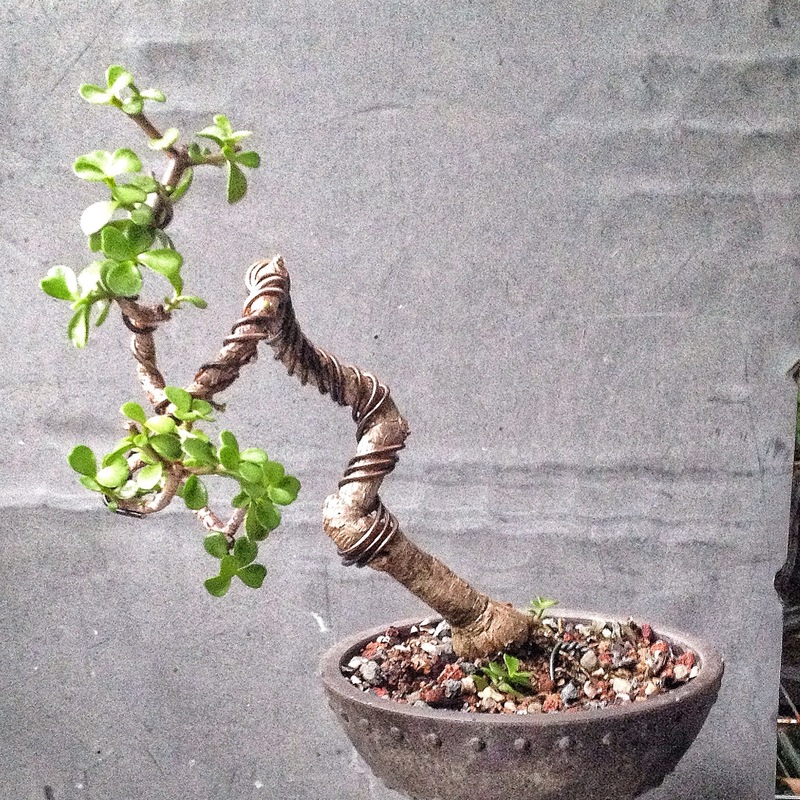 The last word (and lesson) on Barb’s portulacaria, the tree’s trunk and nebari will improve in the pot we selected. 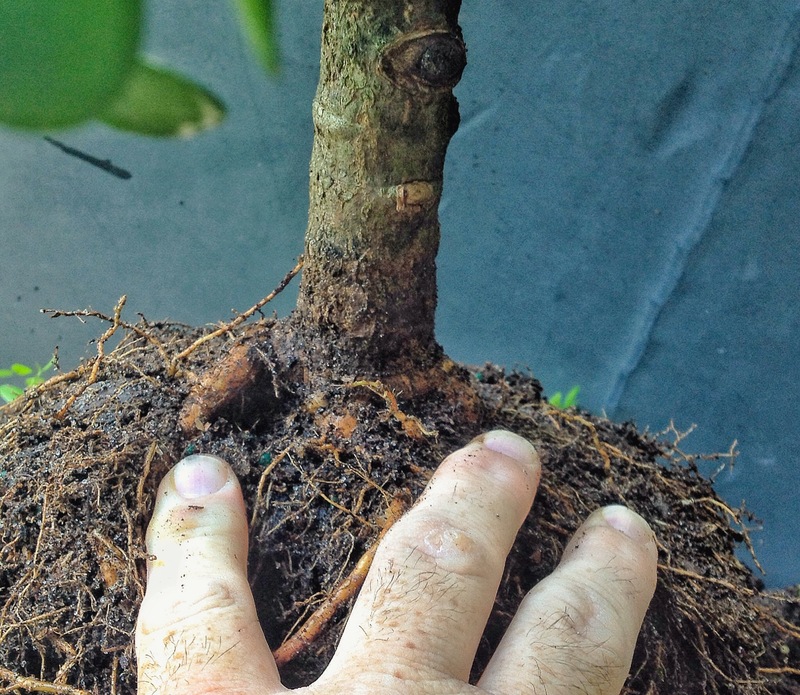 The deepness will allow the soil to dry more quickly, pushing the jade to grow faster. The principle is this: as the roots grow, so does the top, if the roots have to search for water, they have to grow to do it. 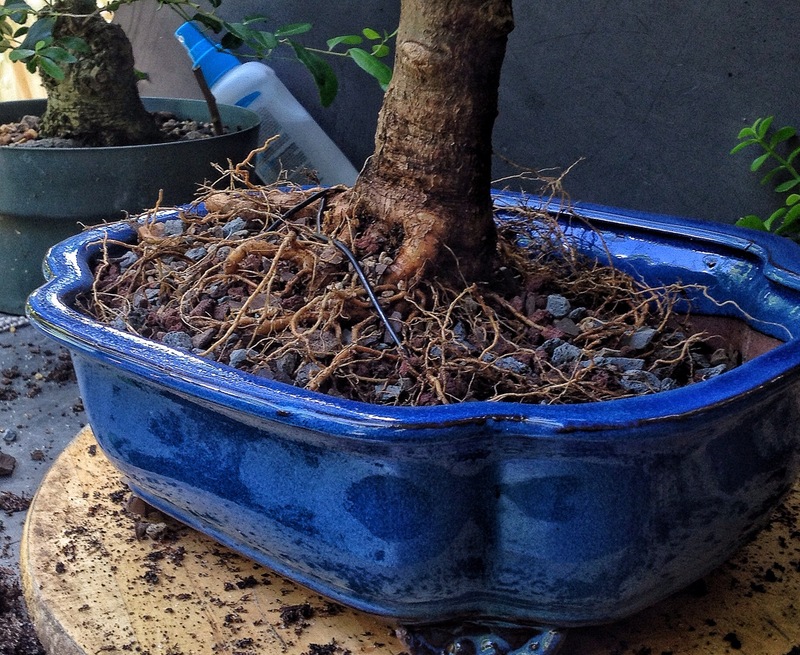 That’s why a bonsai is easier to keep small in a more shallow pot, the water is closer to the roots and they stay wetter, longer, and there’s no reason to grow. They are happy and lazy, with no need to grow. But don’t go killing your plants by withholding water. 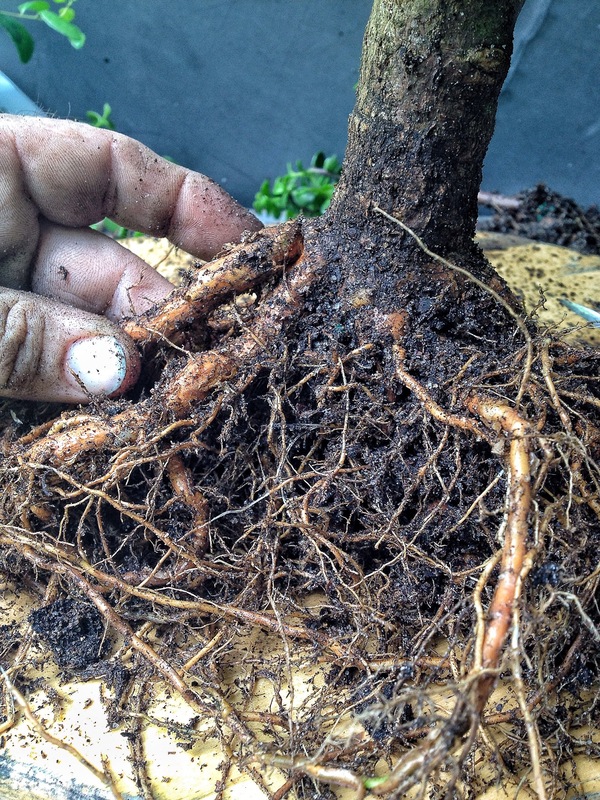 It’s a process of drying and wetting that works, in conjunction with proper bonsai soil, good drainage in your pots, proper lighting and heat, and strict observation of your trees needs. The next post will be on my trip to see Ed Trout and the tree he worked on. Here’s the Barb that Adam is referring to…..”Barb Wire” if you liked his bad joke. 😉 But I LOVE the end result. It is isolated, without water, and in a few days will go back outside. Yes, the existing leaves have shriveled and are falling off. I appreciate you mentioning that in the blog or I would have panicked! And I appreciate the drawing of what it will look like if I do MY part. Thanks again for your skill and vision….I so appreciate it! great job adam! but I would love to read Barbs check list of her part. I suppose you left her with recommendations. 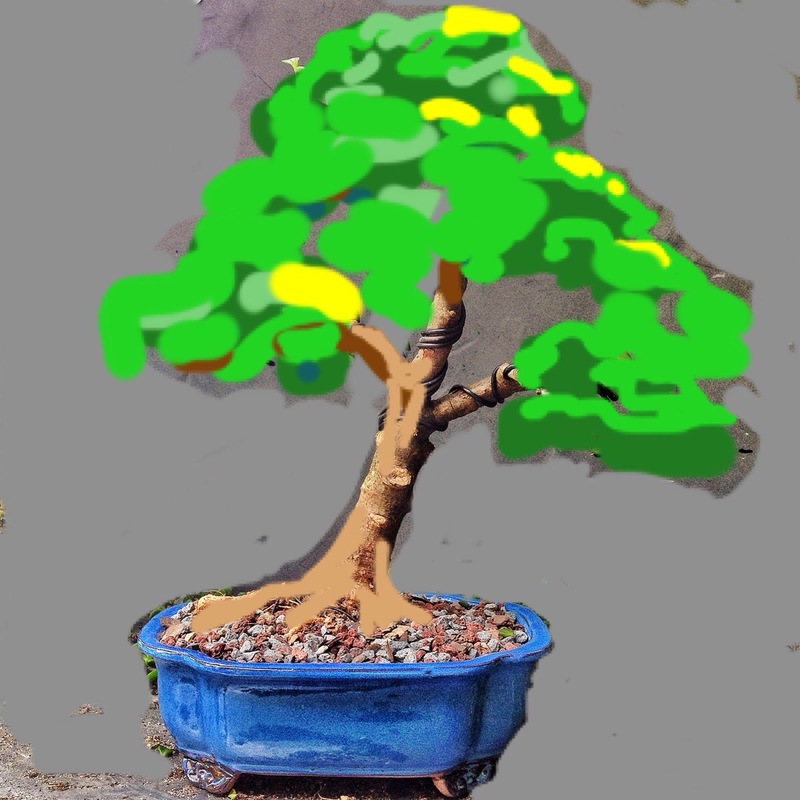 we already know the watering regime for the first week, Adam, what I am gettimg at is requesting a future blog on watering bonsai. Not just in florida, but all of your experience. ohio, Kentucky, I live in nc. I could do a short post on watering but it’s really a specific thing to a persons backyard, the time of the year and even the individual tree. Informative and entertaining! What more could one ask? So with branches that act more like celery when responding to bending, would there be any advantage to waiting to wire until you see the start of new buds? I would think the branches would be a bit less turgid thus making it a bit easier to bend without breakage? That doesn’t help. Letting it dry out a bit helps with jades and some other trees though. 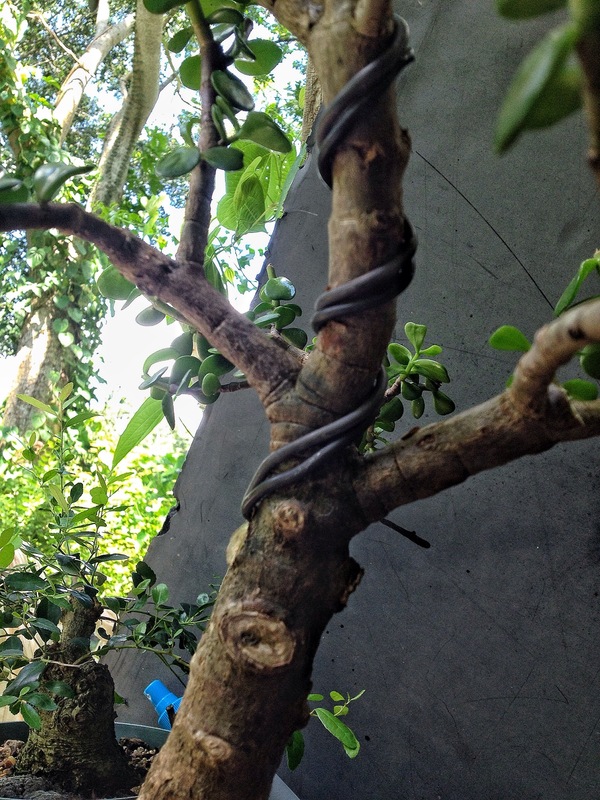 Hey Adam, concerning the bending/splitting you’re showing in https://adamaskwhy.files.wordpress.com/2014/08/img_6442.jpg: will the p.afra handle that damage fine or should it be babied in some way to help the branch recover? It can handle it fine, it heals pretty quickly from it.